* How to post photos to the forum. * Associating your Facebook account (for existing users only). * Setting up notifications and how to see them. * How to contact the TIG team. * Upload via your mobile phone! 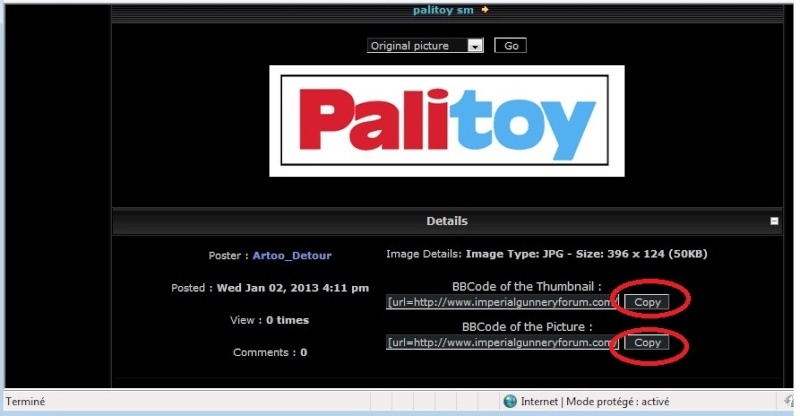 * Upload with the forum in-built Servimg feature. * Upload and save to your personal gallery on TIG. * in 2017 Photobucket asked their users to pay a fee to continue using their service to host images on places like forums. This has resulted in some images at TIG being forcibly removed. TIG advises that you no longer use Photobucket here and instead take advantage of our Servimg or Galleries options which will always remain FREE to use so long as the site continues. 1. To use the attachment feature first you need to hit reply to a thread. 2. Notice at the bottom under the reply typing section there is a section that says attach file. 3. Click browse and then find your picture and select it and then click open on that window. 4. You can fill out the comment section in the same box to label the picture or leave it blank, but the next step is to fill out the reply text and then select the send button in the attach file box. Now is your chance to make a comment for the pic and add text to the reply if you desire. The picture should now be attached to your post. If you hit preview on the post itself you will only see the text as the attachment pictures do not show up in the preview option. Finally hit send on your reply as you normally would and now when the post is put in place it will show the attached picture. The attached picture will show up in a gray box with a download option in the box. 1. When you want to add a photo when replying to or making a post click the "HOST AN IMAGE" button. 2. Click the "SELECT FILES" button to locate your photo stored on your computer or device. You can drag and drop or select individually. 3. 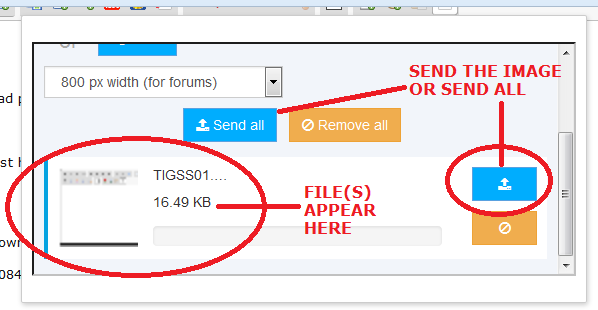 When your file(s) are selected click either "SEND THE IMAGE" or "SEND ALL"
4. A new window will open. From here you can choose between 3 options.... a link, a large image, or a thumbnail image. 5. Copy the code and paste onto the blank screen area of your post. 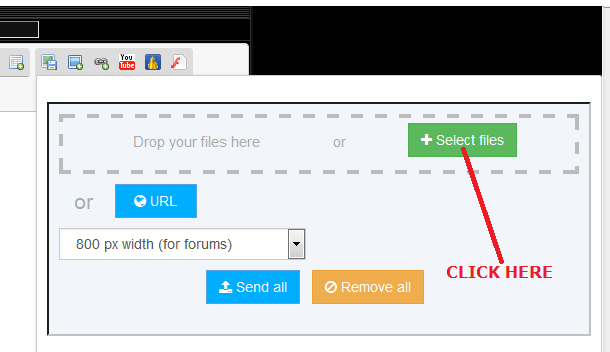 Or, click on "INSERT ALL" if you want to upload multiple images. On the ipad I was able to put 20 images in (presumably could have done more) and click insert all and it automatically put them all in the post without me copying or pasting anything. On the desktop this worked for me only after I typed a message in the reply section. 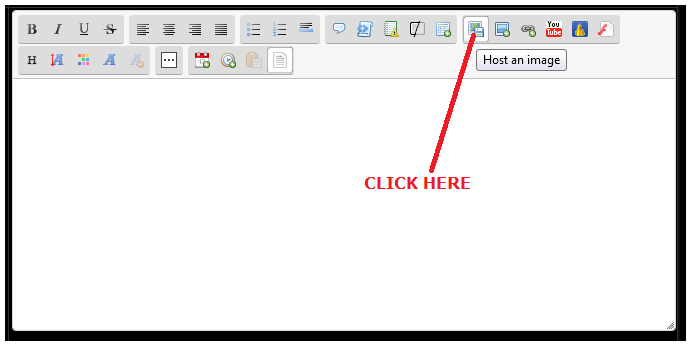 If it does not automatically insert the links for you, you may have to copy them each individually and paste them as before. 6. Finally, hit the "PREVIEW" button below your post to see how your image looks. The "Preview" shows how your post looks including text and any files. If all is good hit "SEND"
Posting using the TIG Gallery feature to save and upload pictures: all TIG members receive their very own personal gallery space! 1. Go to "Galleries" on the tool bar at top of page. 2. Go to "Your Personal Album". 3. Go to "Upload Pic". 4. A new window will open. 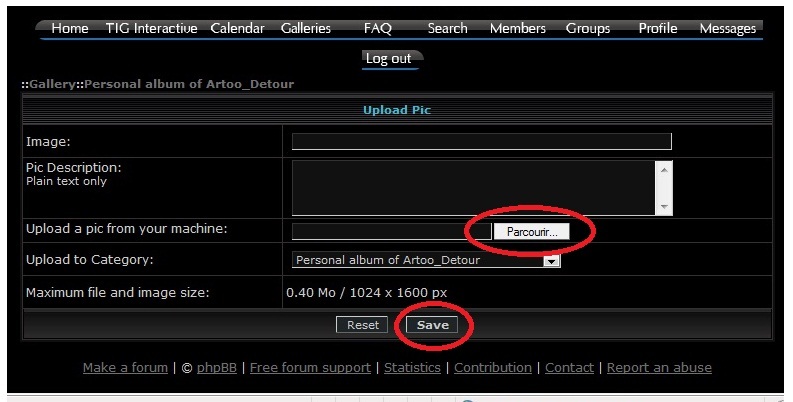 "Search" for the photo you want on your own computer, upload then hit "Save". 5. You will receive a message saying 'Your picture has been uploaded successfully' then you will be automatically redirected to your album. Click on the photo you have just uploaded. 6. Copy the code and paste into your post. You can choose from a thumbnail or fullsize pic. Associating your Facebook account for existing users only. Guys first thing we are trying to catch up to a more modern era and hoping that the forumotion software we use can be used to its full potential. This is a way to associate your Facebook account with your TIG account for existing users. 1. Log in obviously and then go to your profile section on the menu bar. 3. Click on the associate Facebook account button and fill it out. That is it. Once this is filled out you should be able to log in using your Facebook from this time forward. For new users when you see the option to log in for the first time use your Facebook log in and it should set up the account for you. Guys you may have noticed the new stuff when you log in. 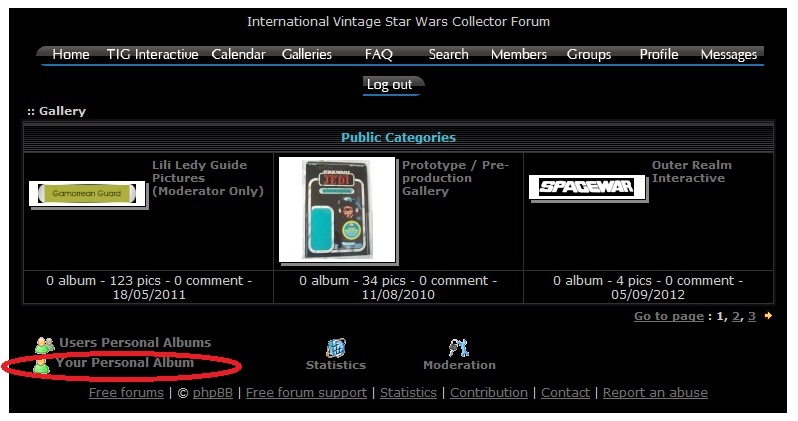 Along the top of the page you should see a bar that shows forumotion with a search area, the various ways you can share the forum via Twitter; Facebook; etc..., then will be welcome and your user name, and then a notifications tab. If the notifications tab is not present yet don't worry, that is what I am about to explain. Now this notification stuff is really a cool option that allows you to recieve notifications for various things that are done on this forum. Now we will walk through the steps to get this set up. 1. Log in and on the main menu bar under the logo art click on the profile tab. 2. Click on the notifications tab within your profile. 3. On the right hand side you should see the by email and the in toolbar option. Select the ones you would like to be notified of in the toolbar and then click save. 4. Now when something happens that you selected to be notified of you will see a number next to the notification tab in the upper right hand corner. if you are on a desktop you can click the notification tab in the corner and it will show what action you are being notified of. If you are on an iPad the notification tab in the upper corner will show the number, but you will have to access your profile and the notification tab again to see the notifications at the bottom under the area where you clicked what to be notified of earlier. Ok, if you have set up the ability to be notified by someone tagging you in a post you may be wondering what tagging someone is and how it works. Basically by tagging someone it will give them a notification (if they have set it up to do so) and alert them to the post they were tagged in. 2. You will need to then put the username (must be spelled correctly) in parenthesis with no spacing. In the following example I am using spacing but when doing this leave the spaces out. Ex: @ " darthberizing "
You can also contact members of the TIG team by sending them a PM.